I met Google the poodle by lucky accident. His name on the Nevada SPCA list was Valdemar. Therein lies a tale. Still grieving the loss of our family’s beloved Jack Russell terrier/poodle mix, Ben, two Christmas Eves ago, I volunteered at The Animal Foundation as a new Las Vegas resident. This amazing facility with a large staff, certified vets and many volunteers, admits, on average, 93 cats and dogs a day. No one is turned away. After a meticulous orientation session about walking small dogs, I spent energizing sessions walking Duddley, Moshita, a different Ben, Sam, Vivian and others who had to be wrestled back into their lonely kennels. Many of these were Chihuahuas and other diminutive breeds. It was thrilling to see so many Las Vegas families, including ecstatic youths, shopping for pets, walking them, and evaluating their personalities. I overheard one child asking his dad, “Why can’t we have two?”, and I couldn’t resist: “Three would be better!” The dad smiled, sort of. At the foundation on Aug. 15, families braved 106-degree heat to line up before 11 a.m. to vie for free pets, either already spayed or neutered, or to have the surgery performed the next day before release. On that amazing weekend, 236 pets were given a happy new lease on life. Many strangers queried me — we wore T-shirts identifying us as volunteers — about what it was like to help. Many said they were interested in volunteering despite jobs and family responsibilities. Meanwhile, my energetic sister-in-law, BJ Busch, had been doing research on adoptable pets. 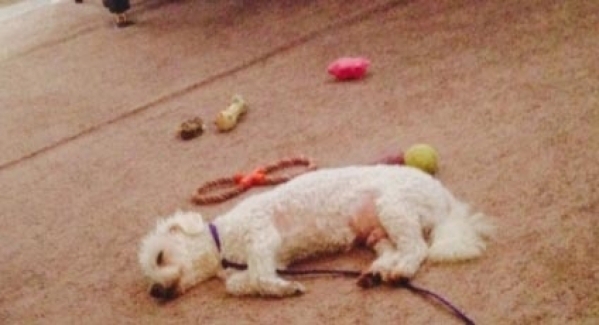 She found Gilligan, a Bichon Frise puppy with a Marilyn Monroe smile, on the SPCA website. I went there the next morning, stupidly not expecting competition. Gilligan was gone, among nine adoptees there in one hour. I asked Dwayne, one of their helpful employees, if any poodles were available. Out trotted Valdemar, a 7-year-old bundle of curly white fur and a frivolously fluffy tail. I walked him in a confined area for about 15 seconds, we bonded, and that was that. His records indicated he had been abused — unbelievable cruelty to this smart and loving creature! Quickly, we completed the paperwork — the $60 fee was less than a vintage cabernet, and I was given his medical records plus a request that I register his microchip ID in the national database in case he got lost. Another easy and helpful process. He was an angel on the way home, enjoying Miles Davis and then exploring every inch of my condo. His taste for Miles was much stronger than that for Rachmaninoff. When I practiced Sergei on my piano, he disappeared under my bed! How did he turn from Valdemar to Google? I thought you’d never ask. Because I am a tenant, I had to pay a nonrefundable pet deposit to offset any damages. So, expecting other expenses as well, I sold one share of Google Class A, which had languished on the stock market like a useless lump. Four days after my transaction, Google reported spectacular quarterly revenues from its search engine and other operations. Google shares jumped $65 billion in one day! Thus, Google’s new name — this little paragon of search, exploration, and cuddling.